For other uses, see Karlsbad (disambiguation). Karlovy Vary or Carlsbad (Czech pronunciation: [ˈkarlovɪ ˈvarɪ] ( listen); German: Karlsbad) is a spa town situated in western Bohemia, Czech Republic, on the confluence of the rivers Ohře and Teplá, approximately 130 km (81 mi) west of Prague (Praha). It is named after Charles IV, Holy Roman Emperor and King of Bohemia, who founded the city in 1370. It is the site of numerous hot springs (13 main springs, about 300 smaller springs, and the warm-water Teplá River), and is the most visited spa town in the Czech Republic. An ancient late Bronze Age fortified settlement was found in Drahovice. A Slavic settlement on the site of Karlovy Vary is documented by findings in Tašovice and Sedlec. People lived in close proximity to the site as far back as the 13th century and they must have been aware of the curative effects of thermal springs. Around 1350, Charles IV, Holy Roman Emperor organized an expedition into the forests surrounding modern-day Karlovy Vary during a stay in Loket. On the site of a spring, he established a spa called the Horké Lázně u Lokte (Hot Spas at Loket). The location was subsequently named "Carlsbad" in German after the emperor, who extolled the healing powers of the hot springs, at least according to legend. Charles IV granted the town privileges on 14 August 1370. Earlier settlements can also be found on the outskirts of today's town. An important political event took place in the town in 1819, with the issuing of the Carlsbad Decrees following a conference there. Initiated by the Austrian Minister of State Klemens von Metternich, the decrees were intended to implement anti-liberal censorship within the German Confederation. Due to publications produced by physicians such as David Becher and Josef von Löschner, the town developed into a famous spa resort in the 19th century and was visited by many members of European aristocracy as well as celebrities from many fields of endeavour. It became even more popular after railway lines were completed from Prague to Cheb in 1870. The number of visitors rose from 134 families in the 1756 season to 26,000 guests annually at the end of the 19th century. By 1911, that figure had reached 71,000, but the outbreak of World War I in 1914 greatly disrupted the tourism on which the town depended. At the end of World War I in 1918, the large German-speaking population of Bohemia was incorporated into the new state of Czechoslovakia in accordance with the Treaty of Saint-Germain-en-Laye (1919). As a result, the German-speaking majority of Karlovy Vary protested. A demonstration on 4 March 1919 passed peacefully, but later that month, six demonstrators were killed by Czech troops after a demonstration became unruly. In 1938, the majority German-speaking areas of Czechoslovakia, known as the Sudetenland, became part of Nazi Germany according to the terms of the Munich Agreement. 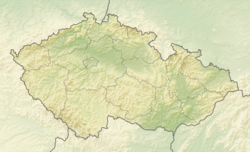 The areas included Karlovy Vary (whose name returned to Karlsbad). After World War II, in accordance with the Potsdam Agreement, the vast majority of the people of the town were forcibly expelled because of their German ethnicity. In accordance with the Beneš decrees, their property was confiscated without compensation, and the town was renamed again Karlovy Vary. Since the end of Communist rule in Czechoslovakia in 1989 and the fall of the Soviet Union in 1991, the presence of Russian businesses in Karlovy Vary has steadily increased. A panorama showing most of the spa/historic section of Karlovy Vary. Key sites, from left to right, are: the dark grey, socialist-era Thermal Spring Colonnade (also Hot Spring Colonnade or Sprudel) featuring a glass chimney. Directly above is the twin-steeple Church of St. Mary Magdalene. The large, stately building on the central hill is the Hotel Imperial. Below, to the right of the square, is the Opera House. The Grandhotel Pupp is the large white building, far right. In 2012, non-Czech residents were around 7% of the population of the Karlovy Vary region. After Prague, this is the highest proportion in the Czech Republic. The largest group of foreigners were Vietnamese, followed by Germans, Russians, and Ukrainians. Local buses (Dopravní Podnik Karlovy Vary) and cable cars take passengers to most areas of the city. The Imperial funicular is the oldest in Europe and the Diana funicular was the longest during the reign of Franz Joseph I. in Austria-Hungary. The city is accessible via the expressway R6 and inter-city public transport options include inter-city buses, Czech Railways, and Deutsche Bahn via the Karlovy Vary–Johanngeorgenstadt railway. Karlovy Vary Airport is an international airport located 4.5 kilometres (2.8 mi) south-east from the city, at the nearby village of Olšová Vrata. As of August, 2018 the airport is only serviced by scheduled flights to Moscow. In the 19th century, Karlovy Vary became a popular tourist destination, especially known for international celebrities who visited for spa treatment. The city is also known for the Karlovy Vary International Film Festival, which is one of the oldest in the world and one of Europe's major film events. It is also known for the popular Czech liqueur Becherovka and the production of the famous glass manufacturer Moser Glass, which is located in Karlovy Vary. The famous Karlovarské oplatky (Carlsbad wafers) originated in the city in 1867. It has also lent its name to "Carlsbad plums", candied stuffed zwetschgen. The city has been used as the location for a number of film-shoots, including the 2006 films Last Holiday and box-office hit Casino Royale, both of which used the city's Grandhotel Pupp in different guises. Moreover, the Palace Bristol Hotel in Karlovy Vary had been used as a model for The Grand Budapest Hotel movie. Karlovy Vary is also home to ice hockey club HC Karlovy Vary and its junior branch HC Energie Karlovy Vary (juniors). See also: Category:People from Karlovy Vary. Johann Josef Loschmidt (15 March 1821 – 8 July 1895), Austrian scientist. Princess Michael of Kent (born Baroness Marie Christine Agnes Hedwig Ida von Reibnitz), a member of the British Royal Family, was born in January 1945, prior to the expulsion of the German population later that year. Ludwig van Beethoven, composer, came for spa treatments. He and the poet Goethe would take walks together, much to the delight of the local people. Fryderyk Chopin, composer, and his parents met for the last time during a holiday in Karlsbad, August/September 1835. Anthony J. Drexel, senior partner of Drexel, Morgan & Co. (JPMorgan, today) and founder of Drexel University, died in Karlsbad in 1893 while spending the summer there for his health. Vladimir Voronin, former president or Republic of Moldova, visits Karlovy Vary every year for spa treatments. Ivan Turgenev, the Russian novelist, visited Karlsbad on numerous occasions for its healing waters. Baron Gustaf Mannerheim (1867-1951), Marshal of Finland, President of the Finnish Republic in 1944-46. Carlsbad, New Mexico, United States (after which Carlsbad Caverns National Park is named), Carlsbad, California, USA  Carlsbad Springs, Ontario, Canada, and Carlsbad, Texas, USA, take their names from Karlovy Vary's English name, Carlsbad. All of these places were so named because they were the sites of mineral springs or natural sources of mineral water. ^ "Karlovy Vary - Urban Monument Zone". ^ "Zdeněk Vališ: 4. březen 1919 v Kadani". Virtually.cz. Retrieved 2013-03-26. ^ "Karlovy Vary – Unikátní lázně, do kterých se sjíždí celý svět". Stream.cz (in Czech). ^ Johannes Baier: Goethe und die Thermalquellen von Karlovy Vary (Karlsbad, Tschechische Republik). In: Jahresberichte und Mitteilungen des Oberrheinischen Geologischen Vereins. N. F. Bd. 94, 2012, ISSN 0078-2947, S. 87–103. ^ City of Carlsbad - History of Carlsbad, retrieved 2012-03-23. ^ "Zahraniční vztahy" (in Czech). Magistrát města Karlovy Vary. Retrieved 9 January 2017. John Merrylees (1886). Carlsbad and its Environs. 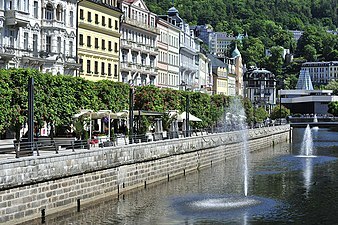 Wikimedia Commons has media related to Karlovy Vary. Wikivoyage has a travel guide for Karlovy Vary.